If you’re on the hunt to find the best above-ground pool heater then I will humbly say this article will tell you everything you need to know to make a smart decision. We’ve crammed so much information in this article you’ll be exhausted when you’re done — and I mean that in a good way. Right here is where you’ll find all the research you’ve been looking to decide on a pool heater (and heat pump), for your above ground pool. What’s the Best Above Ground Pool Heater? Having a pool in your backyard is one of the greatest pleasures that most people desire. It does not matter which part of the world you belong to. This is a luxury that many have craved for and very few achieved. Today, a lot has changed. This is largely due to the fact that the number of people who can afford to have a pool in their backyard has increased significantly. Why? It is simply because installing and maintaining a pool has become increasingly more affordable. Start with an Above Ground Pool— then add heat. The ultimate backyard pool : Intex 28375EH Ultra Frame. At Chainsaw Journal we believe in educating our readers so they (you) can decide on how best to spend your money. The more information you have, the easier it is to make a decision. Personally, I spend a ton of time researching products in my personal life. I don’t spend a dime until I know I know what I’m buying. I’ve worked hard to bring my philosophy to this site. This article will cover 4 excellent above ground pool heaters — all of them are made by Hayward, a company that’s been creating high quality pool products for over 80 years. At the end of the day it’s up to you to decide where to spend your hard-earned money. We feel that these products are worth your serious consideration. Hayward has earned its reputation for top quality swimming pool equipment. Let us know what you think. Intro | Best Above Ground Pool Heater? When you have a pool in your backyard, you want to use it as long as you possibly can. There is however, one difficulty that arises. There are always minor variations in the atmospheric temperature from day to night and major variations of temperature across different seasons. This means that you are confined to using the pool in the day and/or only during the summer months. So how do you find a solution to this problem? This problem was initially solved in the 1st century BC by Gaius Maecenas when he built the world’s first heated pool. Needless to say, this design has undergone numerous changes and today Gaius himself would not be able to recognize his own invention. Swimming originated as far back as 2500 b.c. in ancient Egypt, but swimming pools, like the ones we know today, were invented in the first century b.c. by the Romans. In Rome and Greece, swimming was part of the educational systems of young men. In the early years those Roman pools were heated using water diverted through piping from the surrounding natural springs. Ruins of an ancient civilization in Paestum, Greece. Notice the swimming pool. What does a Pool Heater Do? The main function that a pool heater serves, is to raise the temperature of the water to such a level that it is comfortable for the swimmer. In addition to raising the temperature, the pool heater is also required to maintain a steady water temperature. Though all pool heaters have the same aim, the way that they function helps classify them into three types. Hayward H-Series : 2 models — propane or natural gas. A gas design is the oldest type of pool heaters that are still available in the market. As the name suggests, these pumps function using fuel as a source of energy. The most frequently used fuel sources are natural gas and propane. So how does this type of pool heater work? The heater has a combustion chamber where the natural gas or propane is allowed to combust. We all know that combustion releases energy in the form of heat. This heat is used to heat up the pool water. How? The pool water is passed through copper coils which are in close proximity to the combustion chamber. The transfer of heat from the combustion chamber to the water occurs and this water then moves to the pool. That is how the temperature of the pool water rises. Two different designs: Examples — Hayward H1001D1 and Hayward H150FDN. Though the cost of the gas pool heaters is lower as compared to the solar heaters and heat pumps, it requires higher operational costs. This is simply because it requires a constant source of fuel. 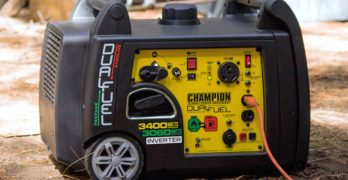 With the increasing prices of fuel, the gas pool heaters have become expensive in terms of daily costs, even though the initial installment is low. Gas heaters provide the fastest mode of pool heating. So if you are always in a hurry to heat up your pool, this may be the obvious choice. Most gas heaters are not energy efficient since their energy efficiency is only 60%. Some models however are said to have an efficiency which goes up to 80%. By choosing such a model, you will save a lot on operational costs. These heaters do not depend on the atmospheric temperature. They function independently and can be used in the night and even when the temperature drops real low. The lifespan of the gas pool heater varies from product to product but an average life span of five years is to be expected. 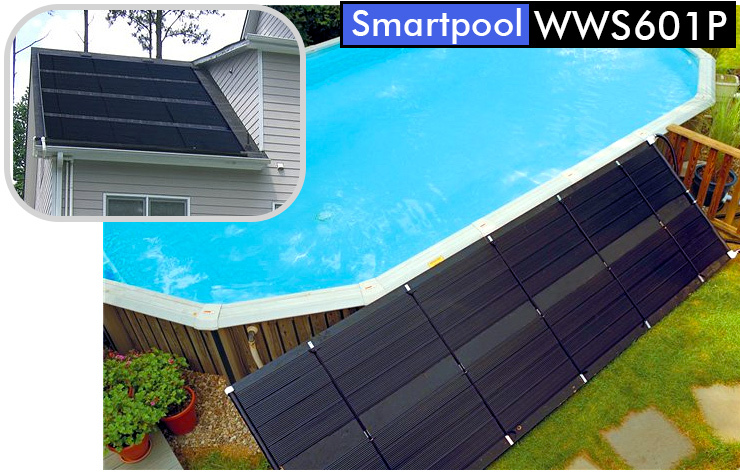 Smartpool WWS601P : You’ll need extra space to place the solar panels. Solar pool heaters derive their energy from the sun. The setup of the solar pool heaters is a little different when you compare them to the gas pool heaters. Unlike the gas pool heaters, the solar heaters do not have a combustion chamber. Instead, they have solar panels. These solar panels are placed in the sun and they absorb the solar energy. It is this energy that is used to heat the water that passes through the solar panels. The water then flows back to the pool. Solar energy is one of the cleanest forms of energy. It makes this type of pool heaters environment friendly. It also means that the solar pool heaters have a high energy efficiency as they use up all the energy that they absorb. These heaters rely completely on the sun for their energy. This means that the solar pool heaters are not effective in the night or on cloudy days. People who use such heaters require a backup option which they can use in such situations. Fafco Solar Heater : Pools 18′ to 24-feet. View manual and brochure. The initial cost of installing a solar pool heater is high but the operational cost of the device is very low and sometimes negligible. Even though the solar panels require very little maintenance, the solar heater has a lifespan of almost twenty years. That is fifteen more years than a gas pool heater! These heaters are best suited for warm and sunny climates. Heat pumps have become one of the most popular types of pool cleaners in the past decade. They function on electricity and can be broadly divided into two categories based on the way they heat the pool. These two types of heat pumps are called the geothermal heat pumps and the Air source heat pump. Will not heat your pool when ambient temperature drops below 55 degrees °F. The Geothermal heat pump uses water to heat up the pool. One might think that like the solar pool heaters and the gas heaters, the geothermal heat pump uses a hot substance to produce heat. It however does exactly the opposite. It transfers heat from water to your pool by using an evaporator coil which is filled with a substance called Freon. The Freon is set at a very low temperature such that it is reduced to a liquid. As water passes over the evaporator coil, heat is transferred to the Freon which causes it to evaporate as it heats up. This gas rises and moves through a condenser where the pool water flows over the coils. Heat is transferred from the gas to the pool water. The gas then condenses to form a liquid. This liquid Freon however, is still not cold enough to function well in the evaporator coil. That is the reason why it is passed through a metering device. This device cools the liquid further. The liquid is then used in the evaporator coil. The Air source heat pumps function in a similar way. The only difference is that they use air instead of water to heat the Freon. Heat pumps are more expensive than gas pool heaters but are less expensive as compared to solar pool heaters. They are energy efficient and environment friendly devices. This is because they do not burn fuel. There is no wasted energy either. Heat pumps require periodic maintenance. They have a life span of ten to twenty years if they are well maintained. The Air source heat pump is dependent on the atmospheric temperature. The geothermal heat pump however is not. This makes the geothermal heat pump ideal for places which have frequent drops in temperature. Is there a difference between in-ground pool heaters and above-ground pool heaters? The answer to the question is yes! Contrary to belief, the difference between in-ground pool heaters and above-ground pool heaters does not lie in the way the function. It however lies in the size of the pool that they can heat. A further explanation may be required to fully understand the previous statements. MAX-E-Therm is for in-ground pools. — HP50TA is for above-ground. The above-ground pool is exposed to air on more sides than an in-ground pool. This means that there is a greater surface area where heat exchange can take place (i.e. heat exchange from the heated pool water to the cooler atmospheric air). This in turn means that there is a larger amount of heat that is being lost in the above-ground swimming pools. So what does this bit of information tell us? Let us answer this with a question. You have two swimming pools of the same size and dimensions. The only difference between the pools is that one is an above-ground pool and the other is an in-ground pool. Which do you think will require more energy to heat? The above-ground pool of course! Not only will the pool require more energy to heat the pool, it will also require more energy to maintain the temperature of the pool. This means that though we use the same kind of pool heaters for in-ground and above-ground pools, above-ground pools require more powerful pool heaters. Now that we have understood this, it is important to understand how to size a pool. Sizing a Pool | What Size Pool Heater do I Need? Sizing a pool is important when choosing a pool heater. It tells us which kind of pool heater is best suited for our pool. If the sizing of the pool is wrong and you choose a pool heater which is too small, you will find that your pool will not heat up adequately. There are different ways of sizing the pool. 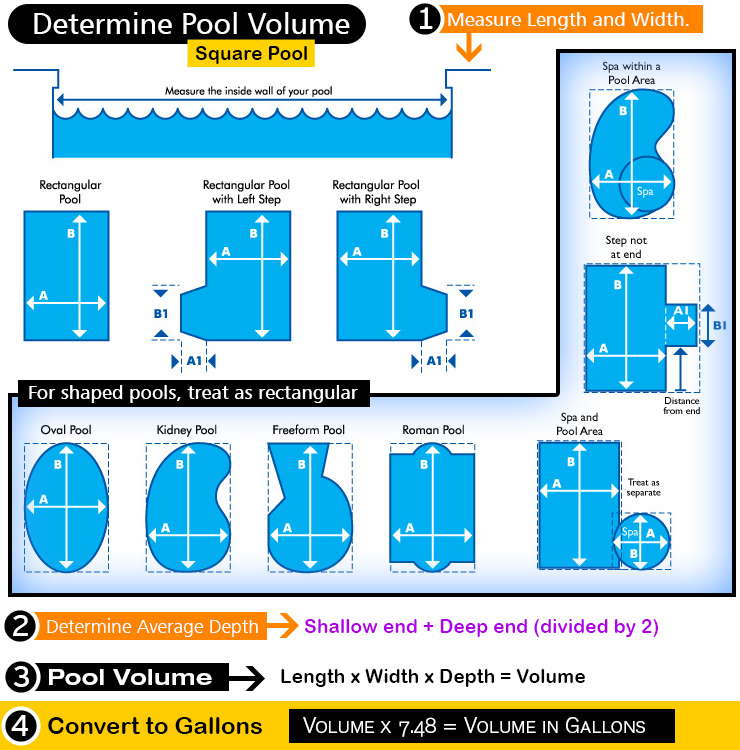 There are a number of different pool size calculators that are available online. They take the size, shape and depth of the pool into consideration. Use the Pentair pool size calculator — it will do this for you. If however, you are interested in doing it manually, then there is a formula that one can follow. Before we start talking about the formula there is one thing you need to understand. The pool heaters are rated on the basis of hp (horsepower) and their BTU output. This will help you understand the formula better. Decide upon your desired pool temperature. Figure out the average temperature for the coldest month of pool use. Subtract the average temperature for the coldest month from the desired pool temperature. This will tell you the temperature rise required. ✓Formula is based on 1º to 1-1/4ºF temperature rise per hour and a 3-1/2 mile per hour average wind at the pool surface. For a 1-1/2ºF rise multiply by 1.5. For a 2ºF rise multiply by 2.0. FORMULA: The BTU output per hour is calculated by multiplying the surface area by the temperature rise. This is then multiplied by 12. Now you may wonder, what is ‘temperature rise’? The temperature rise is the difference between the temperature of the water that you expect and the temperature of the water on the coldest day that you will use the pool. Complicated? That’s why we say that it is best left in the hands of an expert! Now that we have a basic understanding of how the pool heaters function let us look at some of the Hayward pool heating devices which have become popular with pool owners. Choose a pool to match your needs and it will be money well spent. Intex is an exceptional company if you’re in the market for an above ground pool or spa. If you’re reading this article above ground pool heaters then I understand you probably already have a pool to heat, but, if you’re looking to upgrade your pool then we highly recommend Intex pools. For more information read our guide to buying an Intex metal frame pool. Also, you can visit the Intex site and use their online guide to help you select the best above ground pool for your needs. Now, let’s move on to the focus of this article — choosing the best above ground pool heater. The Hayward pool heaters are available for both above-ground and in-ground pools. The reason why Hayward has become so popular among pool owners is because the pool heating devices are energy efficient. Hayward has consistently provided us with pool heaters have a high performance. This means that people who install Hayward devices have a lower operational cost and lower maintenance costs. It makes their products all the more appealing. A dependable heat pump for small above ground pools (under 13,000 gallons). Excellent salt water and chemical corrosion resistance. Exclusive ‘Ultra Gold’ evaporator coil corrosion resistant especially in coastal areas. Quiet operation. Quieter than a normal conversation. AHRI certifieder performance. Independent lab certified performance guarantees quality. 2″ x 2.5″ CPVC union plumbing connections. Common union for installation or service, adapts to larger plumbing recommended for greater efficiency. View or download the MANUAL for the Hayward HP50TA HeatPro. 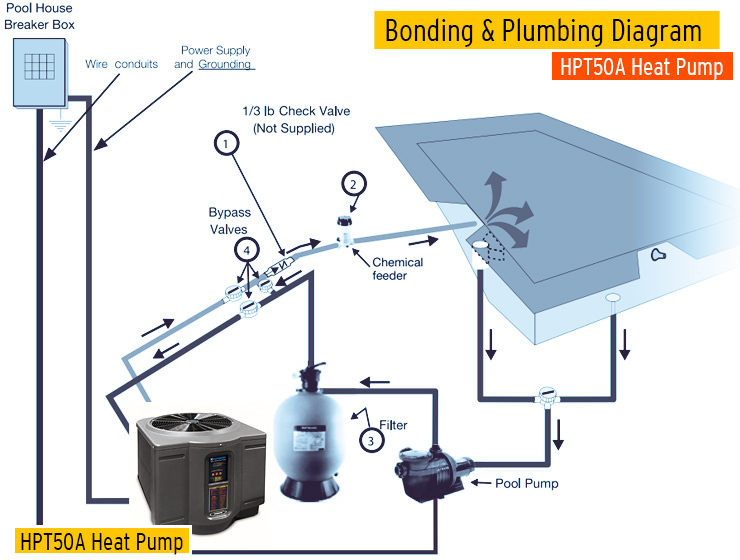 View or download the DOCUMENTS for the Hayward HP50TA HeatPro. The Hayward HP50TA is designed to be used in above-ground pools. This means that this particular device is strong and powerful. Not only does it have power, it is also considered to be one of the most energy efficient pool heaters in the market. So what does the HP50TA have that makes it so special? The HP50TA is a 50,000 BTU pool heater. It is effective for a pool that contains 13,000 gallons of water. It comes with an electronic temperature level modulator. This allows you to set the desired temperature. The Hayward HP50TA will heat the pool water and ensure that the pool water is maintained at a constant temperature. It’s heat exchanger is made out of Titanium. This makes it rust resistant and highly durable. Since the device is immune to corrosion, it is the pump of choice for pools in coastal areas. Why? Simply because, the high salinity increases the risk of corrosion. The HP50TA has a higher durability and will last longer than other pumps in such conditions. The Titanium also helps in heat transfer, making the HP50TA extremely energy efficient. The safety cabinet of the HP50TA makes the device resistant to vibrations. That is not all! The device is also resistant to UV rays and extreme cold conditions. The HP50TA comes with a silent compressor. Even the fan is specially designed so as to minimize noise. The fan is also designed such that it uses minimum energy and optimizes air flow. Despite all this equipment, the HP50TA is extremely light and weighs just 120 pounds. If you think that the deal can’t get sweeter then consider this! The HP50TA uses Ultra-gold to cover it’s evaporator coil, the injection formed body panels, the polyethylene screen and even the stainless steel hardware. Why? It makes the device more durable and sturdy. Finally, the device also comes with an LED control board. This control board is used to regulate the temperature of the water. Read our in-depth article on the entire Hayward HeatPro series, which includes a full line of heat pumps for your in-ground pools. Completely impervious to any high wind situations. 100,000 BTU input for above-ground pools and spas of all types and sizes. Electronic, direct-spark ignition for total control and automatic operation. Convenient On/Off switch to maintain consistent temperature set point. Revolutionary induced draft technology ensures optimum heating and all-weater performance, even in high wind situations. Reduced emissions design provides environment-friendly heating. FireTile combustion chamber ensures quick heating. Jet-ported stainless steel burners provide long life and easy maintenance. One-piece copper header/heat exchanger for leak-free performance. Cool-to-the-touch cabinet surface temperature ensures worry-free use. Plug-in 120 volt electric cord for easy installation. Same water velocity through all tubes for faster heating. Up to 18% savings by reducing pump run-time. 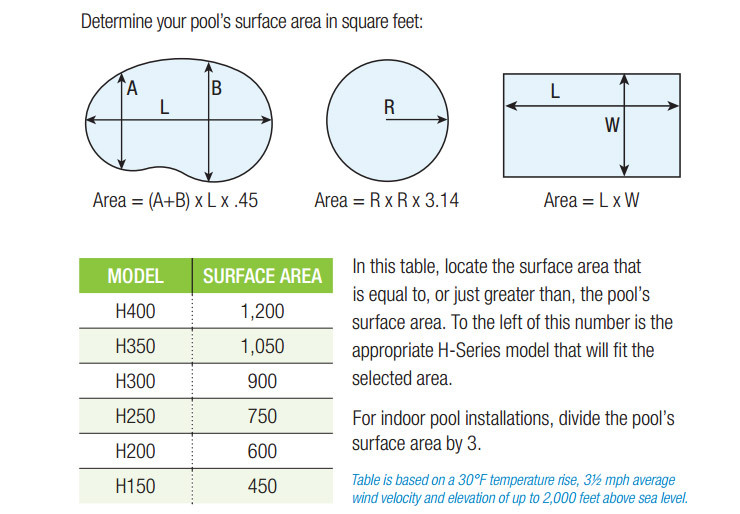 View or download the MANUAL for the H100ID1 pool heater. This Hayward H100ID1 is a very powerful device. It is especially designed to for spas and above-ground pools, where higher amounts of energy are required to maintain a constant temperature. The H100ID1 has an output of 100,000 BTU and even has an efficiency of 81 percent. This makes the Hayward H100ID1 one of the most energy efficient gas pool heaters in the world. Let’s take a glance at what makes the Hayward H100ID1 so powerful. The H100ID1 works on natural gas. Like the Hayward Universal H-series, the H100ID1 also has a FireTile combustion chamber. The heat exchanger in the H100ID1 is constructed out of a single piece of copper. How does this help? It ensures that the H100ID1 provides years of amazing performance without any issues of leakage. The electronic ignition system of the H100ID1 is designed to ensure ease and comfort when starting the pool heater. It also makes the device very reliable. 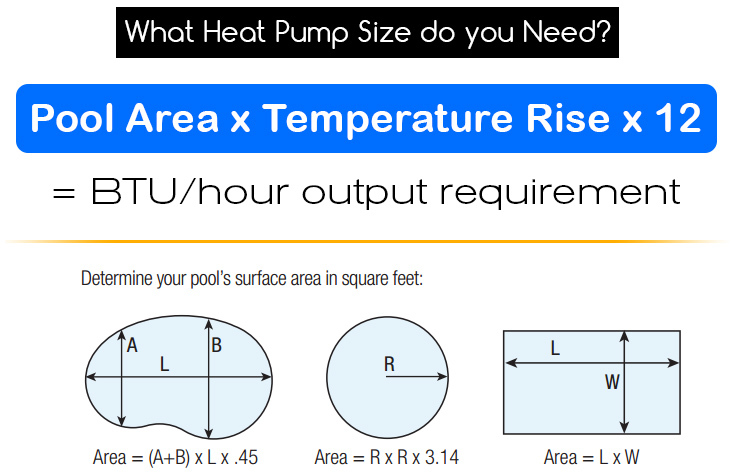 Above Ground Pool temperature rise speed according to pool size. The Hayward H100ID1 has an engine which requires very little maintenance. This is because the company has incorporated the use of a very top notch burner called the Jet ported Eugenox burner. In an era where everyone is worried about global warming, the Hayward H100ID1 takes a step in the right direction. Unlike other models, the Hayward H100ID1 produces reduced emissions making it a little more environment friendly. View or download the MANUAL for the H100IDP1 pool and spa heater. View or download BROCHURE for the H100IDP1 pool and spa heater. This is another good model to consider if you are looking at the Hayward H-series. In fact, this model is completely similar to the Hayward H100ID1 model. It has only one major difference. The Hayward H100ID1 uses natural gas as its primary fuel. The Hayward H100IDP1 on the other hand uses Propane. Other than this small difference, both models share the same working structure and functions. The pros and cons of getting this model also is the same as the Hayward H100IDP1. If you have narrowed down your choice to these two models and find it hard to choose, then pause for a moment and consider these two questions. If you have a spa (hot tub), these are the stats you want to know. What is more expensive? Natural gas or Propane? Which is more readily available? Natural gas or Propane? These two questions will help you differentiate between which model is better suited for you. This series has solid reputation with homeowners. The engineers at Hayward have added a gutter feature and integrated into the front casing on all of the Universal H-Series heaters, which was first introduced and tested on the 500,000 BTU model. This feature is intended to increase impermeability to rain. 83 percent thermal efficiency for energy-efficient performance. The Hayward universal H-series pool heater is designed for above-ground pools. The Universal H-series pool heater has a thermal efficiency of 83 to 84 percent. This makes it one of the most energy efficient pool heaters available in the market. Advanced hydraulic performance saves energy by lowering the circulation time of the pump enabling it to raise the temperature of an 800 gallon pool 30 degrees in under one hour. These are Low NOx heaters. What is NOx? These heaters are engineered with industry-leading thermal efficiency and complies with all current California air quality emission standards. If you care about the environment then you’ll want one of these heaters for your pool. Thankfully, Hayward has designed this series in a wide range of sizes (BTU) and two distinct models — one for natural gas and one using propane. The models range from 150,000 BTU to 400,000 BTU. They are also differentiated on the basis of the type of fuel that they consume. Let us take a look at the different models that fall in this category. Natural Gas Models — they look the same as the Propane models. A quick glance through the entire list will help you understand that the Hayward Universal series has a number of different models. Each design has two types of models. One which is designed to use Natural gas as a source of energy, and the other model is designed to use Propane. Like the Hayward’s Induced Draft Natural Gas model (Hayward H100ID1) and the Hayward H100IDP1, the Universal series has reduced emissions. This makes the Universal series more environment friendly. Let’s have a look at what features the Hayward Universal H-series has to offer. The Universal H-series has a superior hydraulic performance when compared to other pumps. This is mainly due to the minimization of the circulation run time. What does that mean? It means that the amount of time spent in circulating water through the pump is very low. This makes it surprisingly energy efficient for a device which uses natural gas or propane. The device comes equipped with a heat exchanger that is made of Cupro-Nickel. This means that the device is built to resist corrosion. The heater has a specialized Finn plate which is designed to heat water faster than usual. This also adds to increasing the device’s energy efficiency. In a gas pump, one of the main features that you should look at is the ignition system. The Universal H-series comes with a hot surface silicon nitride ignition system. This system ensures that you have no problem firing up your engine. The insulation of the combustion chamber is done using FireTile, which has the capability of ensuring that every ounce of heat is put to good use! Like most of the pool heaters of today, the Universal H-series has a LED control panel which helps you regulate the pool’s temperature. What makes the hayward universal h-series different from the hayward’s induced draft natural gas model (hayward h100id1) and the hayward h100idp1? 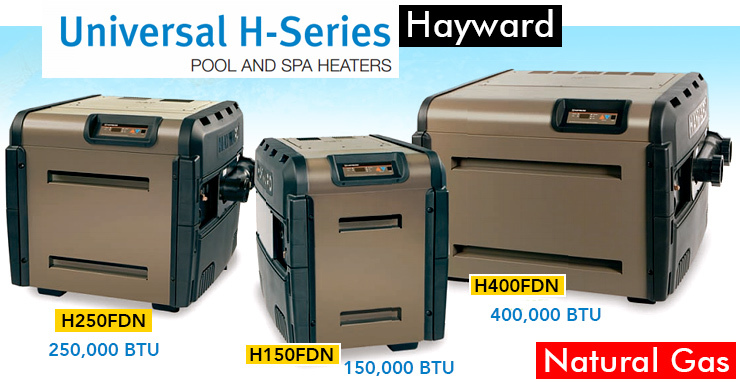 The difference lies in a special feature that the Universal H-series pool heater has to offer. This series has a dual voltage system. This includes both 110V or 220V. The Universal H-series also has universal wiring. What does this mean? It simply means that the device can work on both high and low voltage system. It can also work well with both left and right junction boxes. Though this sounds like a lot of technical jargon but it simply means that the Universal H-series pool heater can be used all over the world. It will ship on a crate. Make sure you remove the screws. An easier explanation may be in order. Every country has its own wiring system. This evident by the different types of sockets and plugs that we see in different countries. It is the reason why many of us carry a universal adaptor when traveling. Sometimes the adapter is not enough. This is because the voltage that is used may be either too high or too low for the device to function. This is why the Universal series is so special. It works irrespective which country you choose to live in! 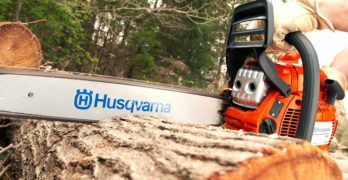 Uses less energy than a natural gas or propane heater. Also includes a cooling mode to help lower water temperature. Hot temperature defrost system to start in lower temperatures. Hayward’s HP50HA, a new 45,000 BTU horizontal heat pump that can heat pools up to 13,000 gallons in volume. This is heat pump is very economical to operate. That’s the advantage of a heat pump. If you wan to learn more about heat pumps and how they operate, I recommend reading our article on the Hayward HeatPro heat pumps. The only thing about heat pumps that you need to concern yourself with is they only operate in regions that don’t dip below 50 to 55 degrees for it to operate. So, don’t expect a heat pump to work in December in New York. Pools equipped with the HP50HA are designed to economically extend the swimming season. It will literally allow pool owners the opportunity to swim longer into the evening hours, earlier in the spring and later in the fall. Pool owners with smaller pools now have an efficient heating solution right-sized for their applications. A pool heater helps us ensure that the weather is not in control of our use of the pool. It ensures that the temperature is pleasant when we swim. No one likes to jump into a frigid pool. In fact, a uniform temperature helps ensure that we don’t fall sick either. If you have decided that you are ready to get a pool heater, then don’t forget to get the pool sizing done. Weigh the pros and cons of each device and see which one works best for you. Choosing the right pool heater is easy if you know what you should look out for! Learn more on the Hayward site. Intex solar cover: Reduces evaporation by 95 percent and retains heat. …in conjunction with your new heater for your pool or spa. It does not allow your heated pool water to dissipate as quickly and is designed to utilize the sun to help to heat your pool through solar rays. A solar blanket will reduce your gas costs and keep your pool warmer — longer! Protect your heater during the long winter from cold, rain, leaves and more. Polyvinyl exterior to shed environmental elements. Mesh inserts on each side for ventilation. Velcro seam makes this cover easy to install and remove. Fits easily around water header plumbing. Non woven lining to absorb moisture and prevent polyvinyl from sticking. Hook and loop to adjust around existing plumbing. Generous fit provides ample room, providing plenty of air flow leaving you with a clean, dry heater. Elastic openings to go around exhaust pipes.